SMALL SUBWAY STYLE MIRROR ON MESH. 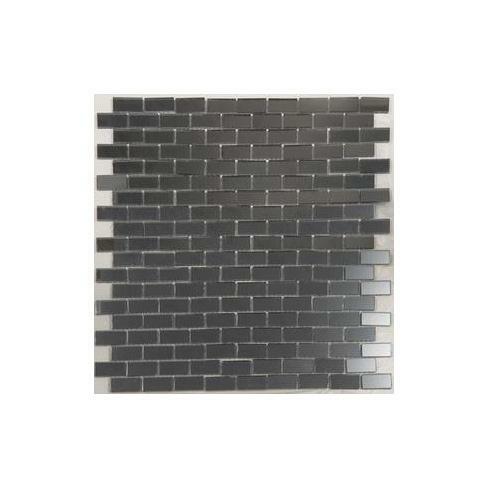 SUBWAY TILES ARE SMALL RECTANGLES. THESE ARE .5" X 1.25" AND ARE 5MM THICK. THEY COME MOUNTED ON S.F. SHEETS IN A RUNNING BRICK PATTERN BUT ARE EASILY REMOVED FROM THE MESH BY HAND. NO SOAKING IS REQUIRED. FINALLY THERE IS A MIRROR TILE THAT EASILY WORKS WITH OTHER TILES. NO MORE TRYING TO COMPENSATE FOR DIFFERENT TILE THICKNESSES. 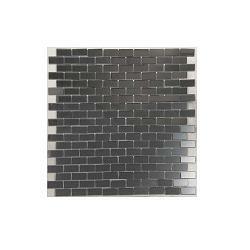 THE SUBWAY TILES WOULD BE PERFECT FOR BORDERS, OUTLINES OR ANYWHERE A RECTANGLE WOULD BE USED. THEY ARE EASILY CUT WITH YOUR WHEELED NIPPERS INTO THINNER LINES OR EVEN SQUARES. AS WITH ALL MIRROR, CARE SHOULD BE TAKEN WITH THE SILVER ON THE BACK. DUE TO THE PATTERN OF THIS TILE, UNFORTUNATELY IT IS ONLY SOLD IT S.F. SHEETS.